Specs include: All-solid wood with hide glue construction throughout; Madagascar rosewood back and sides; Adirondack spruce top with Vintage Tone System torrefaction, high-color wooden marquetry top trim and back strip, torrefied period-correct scalloped 1/4” bracing and torrefied maple bridge plate; one-piece mahogany neck with shallow vintage V profile, slotted headstock with Martin brand at the back; ebony fingerboard with period correct snowflake fret markers, 1-7/8” width at nut, 2-5/16” at the 12th fret; ebony pyramid bridge with 2-3/8” string spacing; bone nut and saddle; StewMac Golden Age reproduction three-on-a side tuning machines with unique engraved plates and pearloid buttons, grained ivoroid binding, extra-thin Vintage Gloss nitrocellulose finish. The 000-30 A 1919 is the new handsome, handmade recreation of a specific and very special 000 (Auditorium) size guitar, built in a version of Style 30 for the Authentic Series of exacting reproductions of singular vintage Martins, the original having been built in 1919. 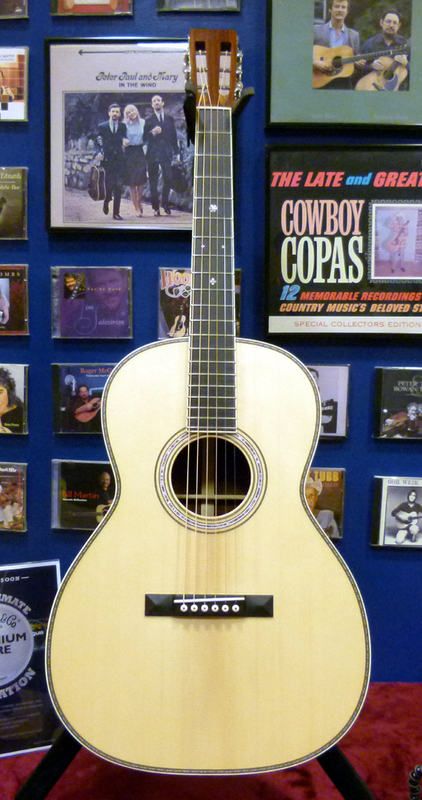 This is the earliest Martin recreated for the Authentic Series thus far, and among the rarest ever built. A couple of years ago I was shown a list of potential Authentic Series models at C. F. Martin & Co, which included a 000-30. I was elated and surprised. Not only is Style 30 one of the coolest of the retired Martin guitar styles, Mike Longworth’s venerable history of the Martin Guitar Company said there was only one such guitar ever made. The Martin production tables in the current version of Longworth’s tome don’t list the model at all. But recent scholarship discovered that they may have made a second 000-30, also in 1919, just before Style 30 was to disappear after six decades of popularity. Fortunately, one of the 000s has survived very much intact, and has now been replicated. This is the second 12-fret 000 model made for the Authentic Series, but it is the first to have a spruce top, as well as rosewood back and sides, which has been hoped for by many people since the current Authentics Series got underway in 2013. And Martin selected one honey of a rosewood 000 to resurrect. The wood marquetry of vivid primary colors trimming the top of this slope-shouldered guitar evokes a time gone by, while the expressive voice provides a refined tone that is timeless in its appealing musicality. With a warm and cheerful disposition, the strings report with both tensionless ease and equal volume, until a thumb puts some extra muscle into the low E string, when the bottom end gains a little weight and turns truly bassy in character. Up top, the unwound treble strings sound precise and pure. Even as they trigger instant reflective resonance behind them, each fundamental note maintains effortless authority. The typical extra presence heard from the low-mids of traditional 12-fret guitars is never muddy, and it never detracts from the clarity of those singing trebles. An Adirondack soundboard treated with Martin’s Vintage Tone System helps the voice expand in all directions, while the exquisite early 1900s construction methods allow it to breathe with ease and transparency, so it fills up a room while keeping the center focused and the surrounding sympathetics spacious and ethereal. Those defined fundamental notes span a sizable, three-dimensional sonic chamber, luminous with resonating tone behind all six strings. And as the notes from each string blend with that open yet colorful undertone, they also launch a canopy of harmonic overtones that hover out in the air as sustaining chords fade back into the warm, woody depths. With its refined high-end clarity, this particular musical instrument may prove ideal for traditionalists who play out their melodies upon the three strings tuned to the highest pitch, while their key rhythmic notes are pronounced from the three lowest strings. The resonance hovering around the lower fundamental notes is colorful yet translucent, like the ether that glows around the flame atop a candle; while the trebles gleam more like the focused glints off a silver candlestick, or the prismed sparkles of a crystal chandelier. To mix metaphors, I immediately equated the overall voice of this guitar with a crisp rosé of blushing color and buoyant flavor that one can see through all the way to the bottom of the glass, rather than a darker, heavier cabernet. 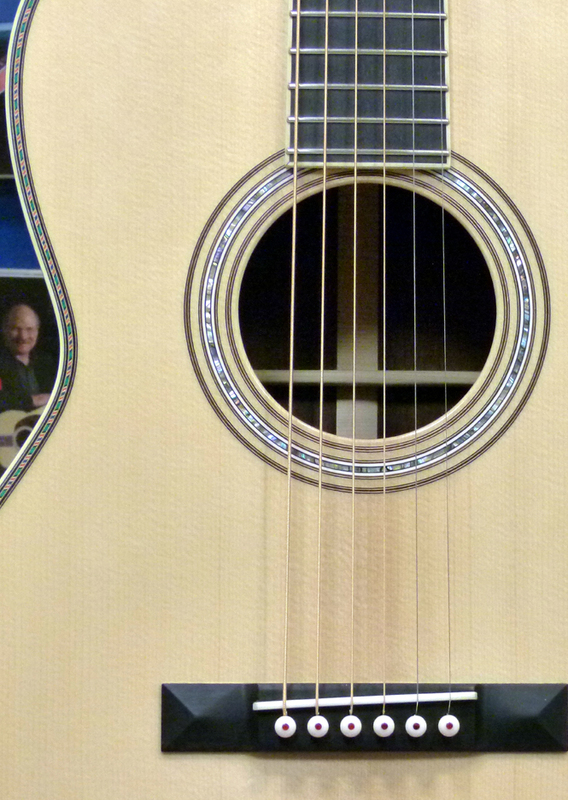 It certainly sounds drier and more airy than the thicker tone typical of a modern Martin made of rosewood. The 000-30 A 1919 offers the kind of sound many luthiers and guitarists have sought to produce since the invention of steel strings. The instrument itself seems nearly lighter than air when resting on one’s knee. It is not quite as weightless as the 00-18 Authentic 1931 (which is made of mahogany) but it is still amazingly light for dense Madagascar rosewood. Apparently all the woods were worked to be on par with the 1919 000-30 in weight and thickness. And like all Authentic Series instruments, the location and shaping of the bracing and bridge plate is as close to identical as possible, with the plate tucked under the main X brace, and brace ends tucked into the cedar kerfing, etc. as was done at Martin until just after WWII. Since the original was made when Martins still came with gut strings more often than not, the Authentic version can be brought to optimum resonance with lighter than normal steel strings. The guitar comes with a set called Custom Light, which has gauges of .011 .015 .023 .032 .042 .052 respectively. Using lighter strings is hardly a concern, as this instrument is not only responsive and resonant, it is downright loud. But it is not recommended to go with heavier strings, due to the ultra-light construction and the fact it has no internal neck support. Martin did not start using wooden truss rods until after Style 30 vanished in 1921. So, this guitar’s neck is made from one solid piece of genuine Big Leaf mahogany from South or Central America, just like the actual 1919 000-30. In fact, the 1919 000-30 was one of the very first Martin guitars to have a neck made from mahogany, which allowed for the use of steel strings, required by slide guitar players of the Hawaiian music craze sweeping the nation at that time. Like the 000-28K Authentic 1921 that came before it, this new Authentic model has a special kind of compression fretting invented just so Martin could recreate such historically accurate necks while using modern T frets, which need replaced much less often than the period-correct bar frets. 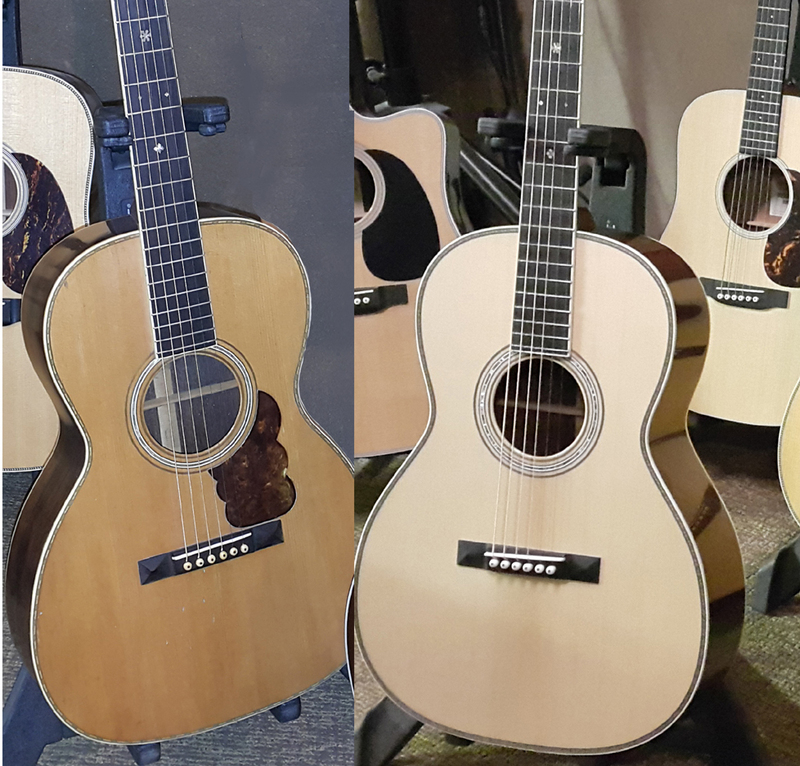 After much testing before they went into production, Martin is confident these necks will last at least as long as those used back in the day. Prior to that time, Martin necks had been made from ceder. The denser mahogany allowed them to use one solid piece for the entire neck, including the headstock, which was previously made from a separate piece of wood. The decorative volute carved at the base of headstocks on high-end Martins today was once a practical joint where the head was glued onto the shaft of the neck. As the oldest vintage Martin yet to become an Authentic Series model, the 1919 000-30 plays exceptionally well, all the way up to sound hole. So the Authentic Series version should be good to go for its own 98-year career. 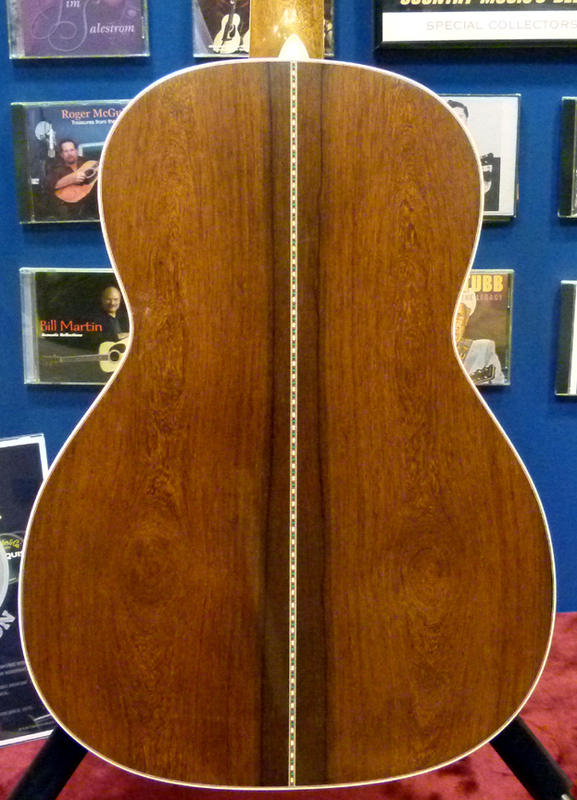 The neck profile of both the original and this reproduction are typical for the era, meaning it is a bit thicker than many modern guitars, but the mahogany is not as thick or massive as Martin necks from the mid-1930s. I should point out that I perceive the neck as being shallower compared to other vintage necks. I have been fooled before into feeling one neck was shallower than another, when actual measurements said otherwise, because of how it flattens out my palm, or because of how easily my fingers reach the center of the fretboard. In any case, the carving makes it feel effortless to play. As with many Martins made before the mid-1920s, it is hard to believe it has a 1-7/8” width at the nut. It reminded me of Classical guitars, in terms of its depth, where the profile gets particularly shallow and flatter behind the 3rd and 4th frets. The V-shaped profile rises from there toward the volute behind the nut, and to a greater extent as the neck thickens toward the heel where it attaches to the rosewood body. However, the V is not as peaked as many pre-1930 necks can be. This includes the actual 1919 000-30, which has a pointier crest to the V than the Authentic model, particularly near the heel. I could see how people familiar with massive V necks or those with larger hands may wish the neck was thicker; but I liked it very much as is. It feels like it was carved to accommodate barre chords and other Classical guitar technique, while still having the sloping V shape that tucks into the nook of the thumb, so it works well with American style thumb-fretting. Take a trip with me in 1919, to County Northampton in the Lehigh country (apologies to Woody Guthrie.) The 1919 000-30 was erected at the crossroads where C. F. Martin & Co.’s venerable designs of the nineteenth century intersect with the progressive luthiery that would evolve into the modern acoustic guitars dominating popular music today. Style 30 was among the most popular Martin styles of the 1800s. 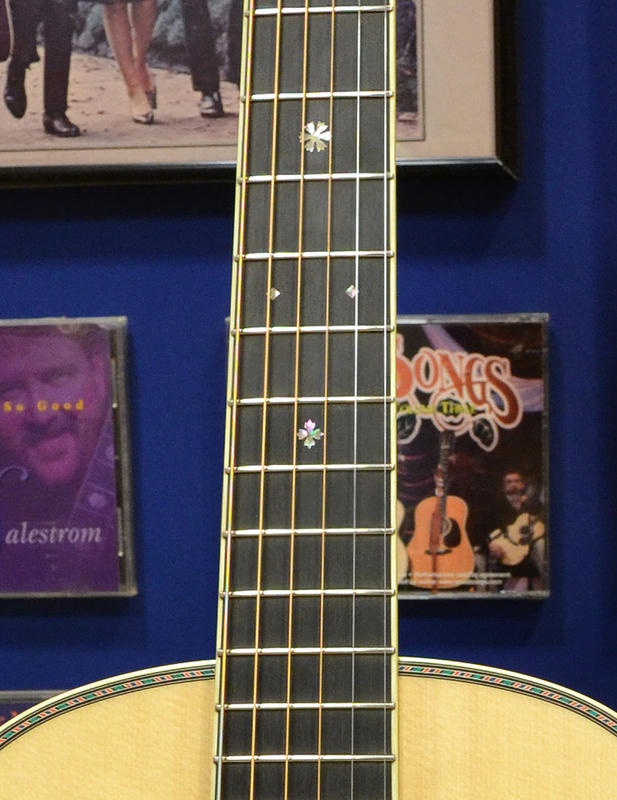 Although it went through many alterations in decorative trim and fret markers over the decades, its hallmarks included a rosewood body with a spruce top and some type of ornate marquetry of brightly-colored wood used for the back strip and purfling, along with a sound hole ring of abalone pearl, and ivory binding around the top and back, as well as ivory binding around the fingerboard, up to the nut at the start of the headstock. It first appeared sometime before 1855, as the Size 2 Martin guitar that cost $30, from whence the style name derives. Orders soon came in requesting guitars with the same aesthetic appointments in larger sizes. But even after Size 00 debuted in 1873, Style 30 was usually seen in Sizes 0 and 1. Although it was retired from the catalog in 1917, examples of Style 30 appear on Martin guitars built in the early 1920s. None of them have the significance of the model used to create this new Authentic Series guitar. The most historic aspect of this rare instrument is found in its binding. The 1919 000-30 is the very first Martin guitar to feature synthetic ivoroid for its body and neck binding, rather than actual elephant ivory. This is especially poignant today, as the elephant faces the dire threat of extinction, and current Martin chairman C. F. Martin IV is passionate in his support of environmental preservation initiatives, like the Save the Elephant movement, which is doing all it can to bring these peaceful and majestic members of our global family back from the brink of annihilation. The 000-30 Authentic 1919 brings back into the spotlight a guitar that combined a popular Martin style from the 1800s right before it disappeared from the scene, with the new 000 Auditorium body that was just starting to gain acceptance, as the largest size ever offered under the Martin brand. Of the 1,065 guitars made by Martin in 1919, 5 were 000s. And the two 000-30s made that year had the futuristic ivoroid binding, at a time when Martin was building guitars that could utilize traditional gut strings, or the steel guitar strings that would strum their way into prominence ten years later, when Martin converted the standard 000 size to invent the first modern 14-fret acoustic guitar designed expressly for steel strings. 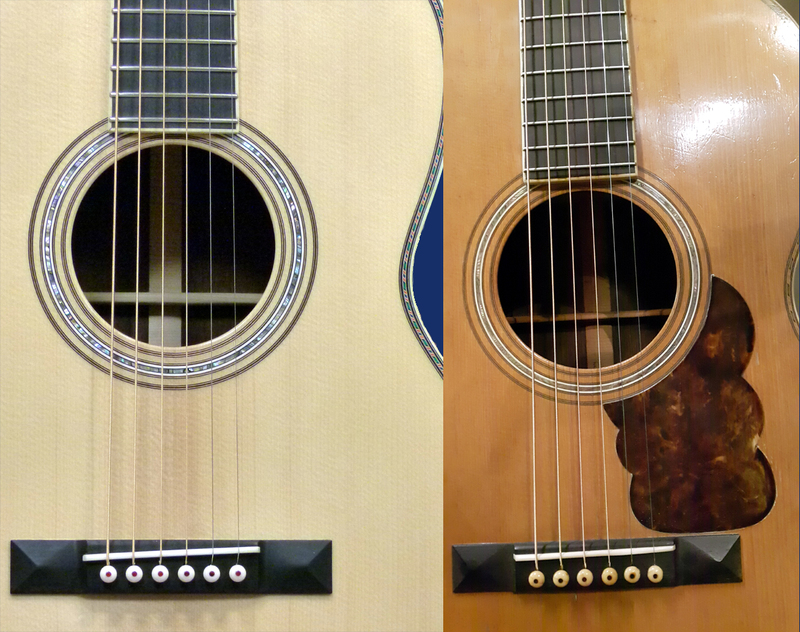 There are three distinct differences between the original 000-30 and the Authentic Series version – the species of rosewood used to create it, the VTS torrefaction treatment applied to the soundboard, bracing, and bridge plate, and the pickguard that is missing from the modern replication. Since Martins didn’t come with pickguards in 1919, the guard on the original 000-30 could have been a special order. But it was likely an aftermarket addition, so they chose not to replicate it for the Authentic Series model. Martin’s Vintage Tone System uses extremely high heat and air pressure to alter the molecular structure of new wood until it resembles and behaves more like wood that has dried out over decades of seasoning. So, the 000-30 Authentic 1919 does not sound exactly like a new 1919 guitar would, in part because the treatment opens up the voice of a brand new guitar until it actually sounds more like a guitar that has been played-in for many years. It is the main cause of the crispy dryness to the chiming fundamental notes, and that 3D depth effect echoing behind them. Read more about torrefaction and Martin’s propriety version of it HERE. 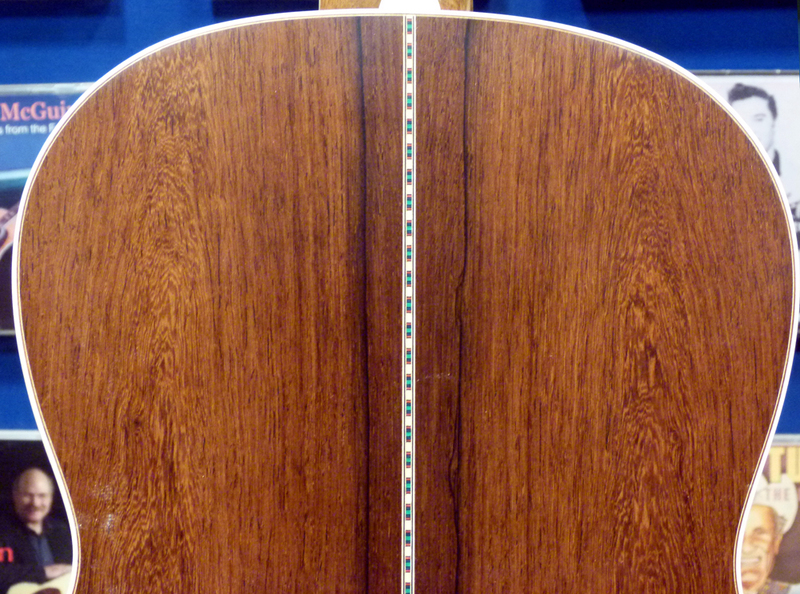 Exotic Madagascar rosewood is considered a close replacement for the Brazilian rosewood Martin used up until 1969. An endangered species, what little Brazilian rosewood is available today comes from dwindling supplies culled years ago, and would add many thousands of dollars to the price tag. Madagascar rosewood has visual beauty similar to that of Brazilian, and has similar tonal properties as well. 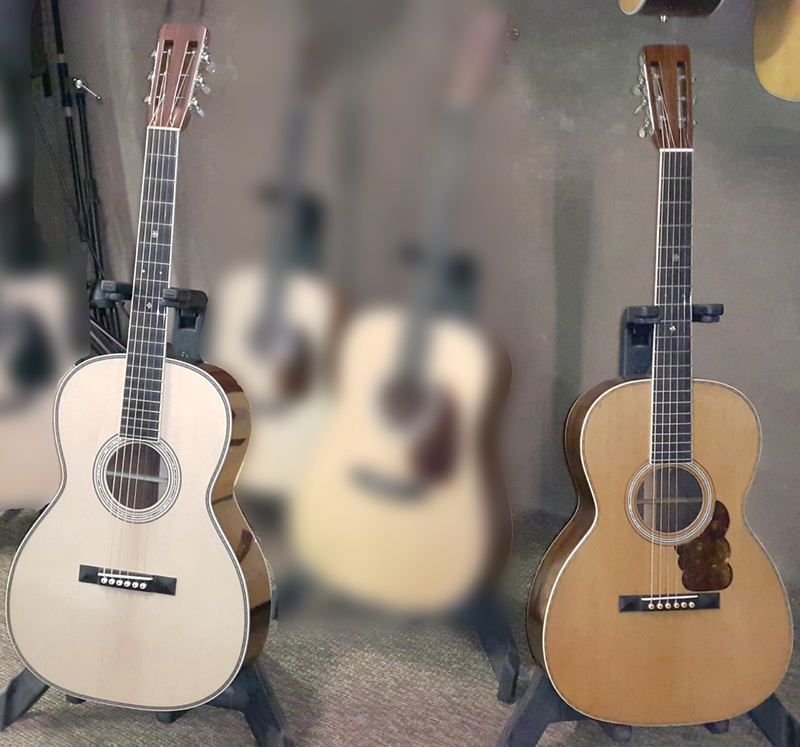 Had I heard these two guitars in a blind listening test, only the pronounced and very musical chime from the Authentic’s treble strings might have clued me into guessing that guitar was made from Madagascar rosewood. As for the colored wood trim, the purfling around the top of the actual 1919 000-30 is different from that on any other vintage Martin I have seen. Style 30, and the nearly identical Style 27 and Style 34 used many different patterns of inlay over the years. 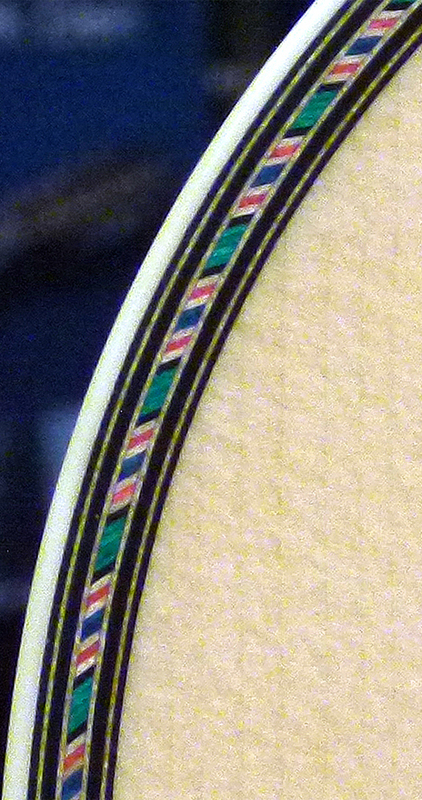 The unifying feature being that it was made out of small, slanted bands of bright primary colors, typically in a pattern referred to as “rope.” But the layout of the rope’s color scheme varied, as does the inlay edging the colored bands, as well as the corresponding back strip and the specific layout of the sound hole rosette surrounding the abalone ring. This specific colored rope consists of tiny bands in the following order: a section of 6 bands consisting of 4 green in a row, with 1 black band at either end, and this is followed by a section of 8 bands consisting of 1 plain wood, 1 red, 1 plain wood, 2 navy blue, 1 plain wood, 1 red, 1 plain wood. I have seen the exact same banding pattern on a 1909 2-30. But it was bordered with narrower black and white rope on each side, and a thin black line as the outermost edge, for a much busier appearance. The colored banding on this 1919 000 is trimmed with two thin black lines set off by thin lines of plain wood. The Authentic Series model uses the exact same pattern. But while the individual bands are laid out in the same order of color, each band is a tiny bit slimmer than those on the 1919 000-30. Thus, each section is not quite as long as those on the original article. Also, one of the black border lines is thinner than the other. But that is pretty nitpicky. To my mind, what makes a Style 30 guitar in the twenty-first century such a cool thing is having the colors as bright and festive as possible, which is why it was such a popular style from before the American Civil War until just after World War I. All existing vintage Martins made in Style 27, 30, or 34 have the colors faded to muted earth tones, from decades of sunlight exposure. And ever since Style 30’s demise, Martin players were limited to extravagant pearl trim, or plain old black and white. But not any more. This colored rope purfling has appeared on two recent artist signature models, for Pat Donohue and Jorma Kaukonen, and the LE-Cowboy-2016 model as well, each with their own bordering. And now it has finally appeared on the first 12-fret Martin model made in actual Style 30 since the Harding Administration. As was originally intended, the purfling on the 000-30 A 1919 provides attractive ornamentation, both colorful and sophisticated, at a more-affordable price point than guitars emblazoned with abalone pearl inlay. And I think it looks awesome. This new Authentic Series model is pretty darn impressive all the way around, as a brand new guitar that is more like an old Martin guitar than not. As I went back and forth between the 000-30 A 1919 and the guitar it is based on, I came to the conclusion that they are closer to each other in both sound and feel than any other Authentic Series model I have been able to directly compare to its namesake guitar. That does not mean they are exactly the same. The unwound trebles on the real McCoy are noticeably thinner in tone and much more limited in their dynamic range. They quickly get spanky and tonally break up under anything like a bending-bluesy attack. The Authentic Series prototype has fatter notes with more chime and more fundamental sustain, and they hang in better during harder playing. Conversely, the 98-year-old guitar has that chorus of ancient, dried out harmonic angels humming ethereally above sustained chords in a way that is a bit more heavenly and glowing than what the brand new 000-30 A 1919 could conjure up. And the lowest bass string on the vintage Martin was a bit plumper and more organically connected to that deep undertone, while the modern reproduction has a bottom bass note a bit tighter, as might be expected for a guitar barely a month old, and needs hit a bit harder to pop out. But when it is laid into with a flat pick it is more resilient and projecting. It should grow fatter as the top gets some regular playing, as has been the case with other VTS Authentics I have had the opportunity to play when they were new, and then played again a year later. But that historically-accurate build with thin, resonant tonewoods, 1919 bracing construction, etc. has produced a guitar that not only sounds a lot like a vintage Martin; it also behaves like one. The tone does not grow thicker or growl into a roar when attacked with vigor, as do most modern guitars. Except for the fatter bass note, it pretty much sounds the same all the way up until the strings start to wig out and slap against the frets. In other words, it maintained the same basic tonal personality regardless of how hard I played it. And that is more-typical of a vintage Martin than a modern one. The biggest difference in the dynamics and response to a Martin from the early twentieth century is in how this 000-30 A 1919 can be attacked a little harder, even if I would not bring to bear the heavy hand I typically use on a Martin made with heavier, modern construction, such as the 000-28VS for example. But it does not require delicate playing, so long as it is not beaten upon. Digging in for some soulful blues picking is both fun and satisfying. Still, it needs no forceful encouragement to get the top moving or the sound to come out of it. In fact, at the slightest provocation it generates music that floats throughout the room like a gentle summer breeze. I did notice that the prototype I played was slightly heavier than the actual 1919 guitar. But that extra ounce or three seemed to be coming entirely from the neck, which could be made from slightly denser mahogany. And since it is a relatively shallow neck by V shape standards, this is not a bad thing. 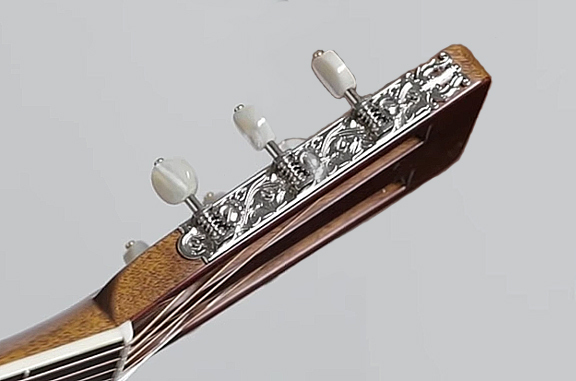 It is also possible there is a little extra weight in the specific nickel alloy tuning machines, which were reproduced for Martin by Stewart-MacDonald, and include pearloid buttons and a decorative lyre at the end of each ornate side plate. I must wonder about the tuners, as they look like they are from around 1900. I wonder if the other 1919 000-30 had them, or if someone at Martin just found them in a drawer or even salvaged them from an older guitar. In any event, the 000-30 A 1919 could fool many an expert into thinking it was a vintage instrument. That is, if it was put into their hands while they were wearing a blindfold. Its physical condition is just too perfect to look at and mistake for a 98-year-old guitar. And when it comes to feel, the neck is smooth as glass, where the neck from 1919 is strewn with pock marks, pits, and craters like the surface of Pluto. The roughness of the old timer’s neck is exaggerated by the finish having worn so thin. But the brand new Vintage Gloss finish on the Authentic prototype is already much thinner than on most contemporary guitars. And that is made obvious when one strums upon the strings and feels the resonant tone vibrating through the back and sides, as if this colorful musical instrument were actually alive and purring from the player’s caress. It is light, it is lively, and it is lovely. 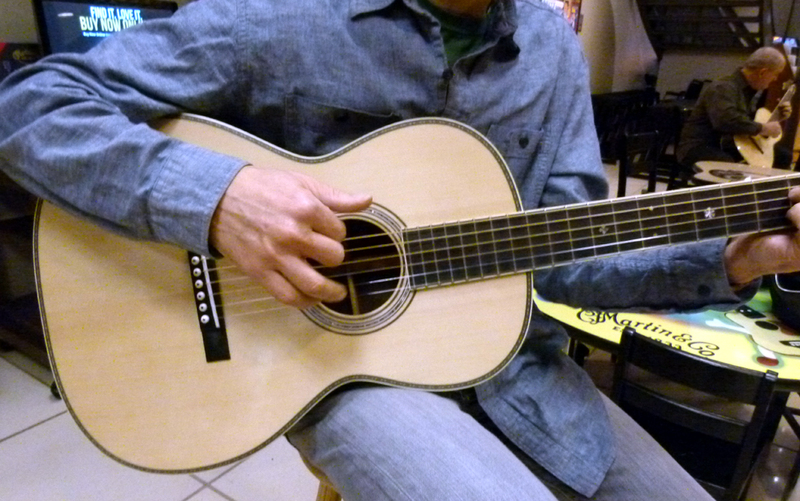 List Price: $8,599 – but call your Martin dealer for their best price. I have what may have been a precursor to the 000-30 A; a custom shop 00 with most of the Style 30 appointments. However, it does have more modern items such a truss rod etc. It’s really a lovely guitar, but I am dying to try the 000-30 Authentic. Just a bit concerned my smaller hands won’t work well with the 1 7/8″ nut (mine has 1 3/4″). Sadly, no dealer seems to have one in stock to audition. I have asked Martin to bring one to the next Martin Event in Pittsburgh! They did have one at the Martin Experience in NYC a while back, along with the 00-18A 1931. I recommend that you write to them again closer to the event and remind them that you are seriously interested in owning one. I thin it likely they will actually offer to sell the guitar to you that very guitar that night at a slight discount. I actually did just that, and they said the rep would bring one to the Event. Of course, I wouldn’t consider buying unless we get close to that magic 40% of MSRP figure! Beautiful playing once again, and well recorded. I was captivated by the chime of the guitar that is very hard to define. There is a delicate shimmer to the notes, that are at odds with your at times, vigorous application, and it’s more than the tonal difference a twelve fret guitar brings. Somehow, I just have to own one. I would like to buy one, but want to know if it sounds better, or is different to my 1931 OM28 Authentic when played finger style. Better is always a matter of personal taste. It will be different. Even if they had the exact same construction the difference between the 12-fret design and 14 fret design would make them sound differently. But, as lightly built as your OM is, the 000-30 is even lighter and the dynamics are different as a result. It blooms and blossoms without much effort at all, but it also does not react to harder playing in the same way, but it is loud enough it doesn’t require harder playing. I haven’t played one for like three months now, but I was happily reminded when I did just how much I liked this model and would be happy to own one if I could afford the luxury of a 12-fret guitar with a 1-7/8″ width nut just because it is a great guitar with cool appointments. Copying this from Readers Questions – apparently a Word Press update in the past removed the Comments link from all of my reviews. Grrrr. But I think I have fixed that.